NormaUSA recently rolled out a handsome new, easy-to-navigate website. 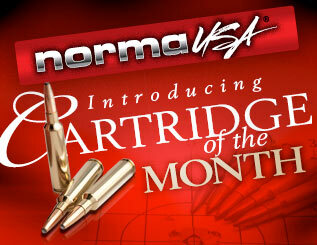 On Norma-USA.com you’ll find information on Norma cartridge brass, bullets, powder and loaded ammunition. The site also offers a collection of videos plus links to Norma Reloading Data. One highlight of the new Norma website is the new Cartridge of the Month section. This feature provides a detailed history of popular cartridges, along with a discussion of these cartridges’ hunting and target-shooting uses. There are currently five Cartridge of the Month articles, with more to come each month. Among the few “wildcat” cartridges to ever be legitimized, the 6.5×284 Norma has the distinction of being the only one to succeed when the parent cartridge — the .284 Winchester — was a commercial failure. The 284 Win’s case had unique design features endearing it to wildcatters. Foremost, the non-belted case featured a rebated rim equal in width to that of the .30-06 Springfield. [B]ody diameter tapers from 0.500” ahead of the extractor to 0.475” rearward of the shoulder. The minimal body taper, when combined with a 35-degree shoulder angle, enabled greater propellant capacity. The latter would be particularly appealing to those individuals who, above all else, demanded ultra-high velocities; remember, this was during the period during which the .264 Win Mag, .300 Win Mag, and other “high-performance” cartridges were unveiled. Additionally, the propellant column was in the desirable short, fat column, which purportedly leads to increased accuracy. With this, the maximum average pressure (MAP) was set at an unusually high 56,000 copper units of pressure (C.U.P. ); to handle such pressure, the case is obviously quite strong. Long-range competitors are particularly fond of the 6.5×284 Norma. Why? Propelling bullets with high ballistic coefficients (BCs) to respectable velocities results in less time-to-target (and thus wind deflection), as well as reduced drop. Compared to proven performers of the past, such as the .300 Win. Mag., the 6.5-284 Norma’s recoil is quite mild—thanks to lighter bullet weights combined with smaller propellant charges. Fatigue from recoil negatively affects performance, so less abuse without sacrificing performance is a huge advantage on the firing line. Share the post "Cartridge of the Month Featured on Norma-USA.com Website"
Tonight’s Episode of Shooting USA TV features the 2013 International Revolver Championship (IRC) from the Hogue Action Shooting Range located near Morro Bay, California. You can see another winning performance by Jerry Miculek. 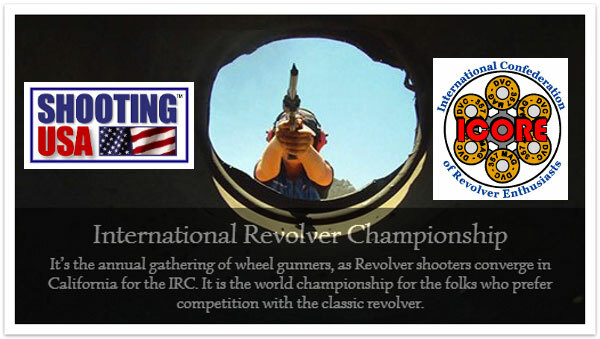 Hosted by the International Confederation of Revolver Enthusiasts (ICORE), this event draws hundreds of the world’s best wheelgunners. John Scoutten and Mike Irvine cover the action. The show airs on the Outdoor Channel at 3:30 pm and 8:30 pm Eastern Time (check local listings for other zones). The IRC, held May 31 through June 2, 2013, was the highlight of this year’s revolver shooting season. More than 240 of the world’s top revolver shooters negotiated their way through 12 stages of fire putting more than 70,000 rounds down range. 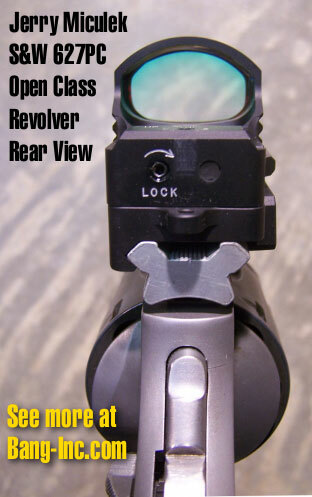 Competition at the IRC is divided into three divisions: Classic, Iron Sights, and Open. Classic Division competitors use six shot revolvers and speed loaders, no moon clips allowed. In the Iron Sight Division, shooters are allowed up to eight rounds in the gun, with moon clips to speed reloads. Traditional iron sights are required. The Open Division includes eight-shot cylinders, moon clips, barrel porting, or compensators, and electronic optics. Share the post "International Revolver Championship on Shooting USA TV Today"